"Nightrain" is a song by the American rock band Guns N' Roses. It is the third song on the band's debut studio album, Appetite for Destruction (1987). Although it was released as a single, the song was not included in their best-of album. It reached #93 on the US Billboard charts. The song is a tribute to an infamous brand of cheap Californian fortified wine, Night Train Express, which was extremely popular with the band during their early days because of its low price and high alcohol content. The title is spelled differently, omitting one of the 'T's between "Night" and "Train", and removing the space, making a single portmanteau of the two words. The song was ranked eighth on Guitar World's list of the "Top 10 Drinking Songs". Slash describes "Nightrain" as "an anthem that we came up with on the spot". The original idea for the song came when Slash and Izzy Stradlin wrote the main riff while they were sitting on the floor of the band's practice room. The next day, Slash was ill so Stradlin finished writing the music with Duff McKagan. However they did not write any lyrics. The song remained incomplete until one night when the band was walking down Palm Avenue sharing a bottle of Night Train. Someone yelled 'I'm on the night train!' and the whole band joined in, with Axl Rose improvising the lines in between: "Bottoms up!" "Fill my cup!" etc. "Nightrain" was born. After this initial inspiration, the band finished the song within a day. According to the autobiography of Paul Stanley from Kiss, the pre-chorus of the song used to be the actual chorus until Rose let Stanley hear a demo of the song and advised Rose to use the chorus as the pre-chorus. The first half of the first guitar solo and the lead intro is played by Izzy Stradlin, while all other lead guitar parts are played by Slash. "Nightrain" is a staple at Guns N' Roses concerts. In earlier shows, it was usually played early in the set. During the Chinese Democracy Tour, it is usually played as the last song before the encore, or during the encore. In some shows in late 2006, Izzy Stradlin, former rhythm guitarist and co-founder of Guns N' Roses, joined the band for "Nightrain" and other songs. Slash describes in his autobiography how "Nightrain" is his favorite song to perform live: "That song has a rhythm to it in the verses that from the start always made me go crazy. The first time we played it, even, I started jumping up and down - I couldn't help it. When we had our huge stage later on, I'd run the length of it, jump off the amplifiers, and lose it just about every single time we played it. I'm not sure why, but no other song we've ever played live made me move like that." All tracks written by Guns N' Roses except where noted. ^ "The Top 10 Drinking Songs of All Time". Guitar World, February 24, 2016. ^ Bozza, Anthony and Slash (2007). Slash, p. 119. Harper Entertainment: New York. ^ a b Bozza, Anthony and Slash (2007). Slash, pp. 118-119. Harper Entertainment: New York. 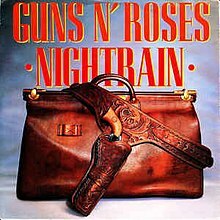 ^ "Ultratop.be – Guns N' Roses – Nightrain" (in Dutch). Ultratop 50. Retrieved March 25, 2017. ^ "Charts.nz – Guns N' Roses – Nightrain". Top 40 Singles. Retrieved March 25, 2017. ^ "Guns N' Roses: Artist Chart History". Official Charts Company. Retrieved March 25, 2017. ^ "Guns N Roses Chart History (Hot 100)". Billboard. Retrieved March 25, 2017. ^ "Guns N Roses Chart History (Mainstream Rock)". Billboard. Retrieved March 25, 2017.